This Nightscout Labs is intended to provide “do-it-yourself” (DIY) guidance on how to achieve redundancy – to avoid being impacted by Cloud Provider and/or Regional outages. Willing to accept that the “Support Team” does not support this for the entire community. This document is written solely with the use of REST API for the Android Uploader; the legacy mongo upload method is not utilized. This document is written primarily for users of Azure hosting, but others can still benefit from the concepts. If your site is down for hours because of a localized outage, are you OK waiting? If your site is down for hours because of a Cloud Provider hardware outage, are you OK waiting? If your site is down because you tried to upgrade it and failed, are you OK not having a site until you can get help, figure out what happened and possibly redo everything? When you upgrade your Nightscout website, do you get real nervous? Do you hold off doing the upgrade to make sure others do it first? Would you prefer to upgrade a separate website first to work out the kinks? If you answered “yes” to any of these, then you would benefit from “redundancy,” but it’s not necessary. Step 1: Document your “current state” – what you have now. Before you decide what you want to do for redundancy, you need to understand what you currently have. Log in to MongoLab.com using your “username” and “password.” You should see your current deployment (see figure below). Next, you need to verify its details. Click the “arrow” on the left edge to expand the deployment information. (See figure below). In this example, the “cgmitcdr” database is deployed in “Rackspace DFW”. This means that the Cloud Provider is “Rackspace” and the geographic location is “Dallas Fort Worth”. Log in to Azure using your “Microsoft email” and “password.” You should see your website(s) (see figure below). Same geographic region, but different hosting providers for Site 1 vs. Site 2 database. Heroku for different database region. Note: This Labs article does not go into the details of Heroku as an alternative or complementary Nightscout Cloud Provider. “How to Heroku” is covered within a separate Labs article, but provides a robust solution for no “single-point-of-failure” (SPOF) by having a separate Cloud Provider, technology stack, and geography. 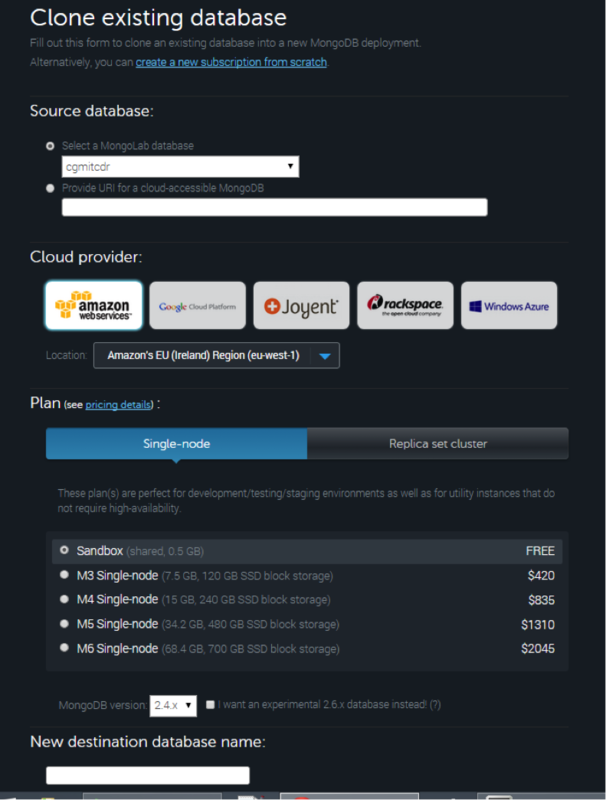 Note: It is important to note here that Mongo as a JSON database is offered by many (5) Cloud Providers spanning 10 distinct infrastructures with overlapping geographic boundaries. Azure, is just one of the options. In addition to Cloud Provider and geographic location considerations, you must also think about performance. When implemented, your phone (“Android Uploader” application) will send the BG information to Site 1 (Azure) and then to Site 2 (Azure). Each of the Azure websites, running the node.js application cgm-remote-monitor, will use its own “mongo” and “mongo_collection” connection string to connect to, write to and retrieve data from the mongo database. As such, if you are in (for example) Virginia, then having the primary website be in Virginia would be good for performance for the uploader, but what if the database is in Ireland (eu-west-1) via Amazon Web Services? Pure physics, it will take longer for the database transactions if the website is in Virginia, and the database is in Europe. And, just like a highway, the longer the road, more potential for speed bumps, traffic jams and accidents — it’s possible that the route from Virginia to Ireland could have an outage since there are many more devices between the two points, but at the same time, there are also many more routes to take (dynamic routing). So maybe it’s OK to have your primary site “Azure and Mongo” both be in Virginia since you are too. In this case, you could use Joyent (Virginia Datacenter) for the Mongo Cloud Provider to separate from Azure hosting both website and database, but keep it in Virginia which is close to where this figurative person lives. 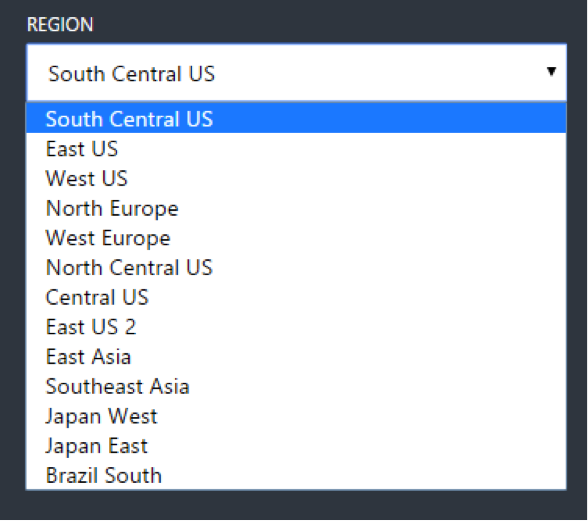 In this scenario, you might want to have your backup site be in a different “non US East” region, and maybe even a far-away Mongo location because you are not as concerned about performance of the “backup site” – you will only use it if there is an outage associated with your primary site. With this simple scenario, the probability of individual failure points and scenarios becomes complex. If you have your primary site solely with Azure within the same location, then a single failure in either Azure hosting or MongoLab hosting by Azure could take out your primary website. 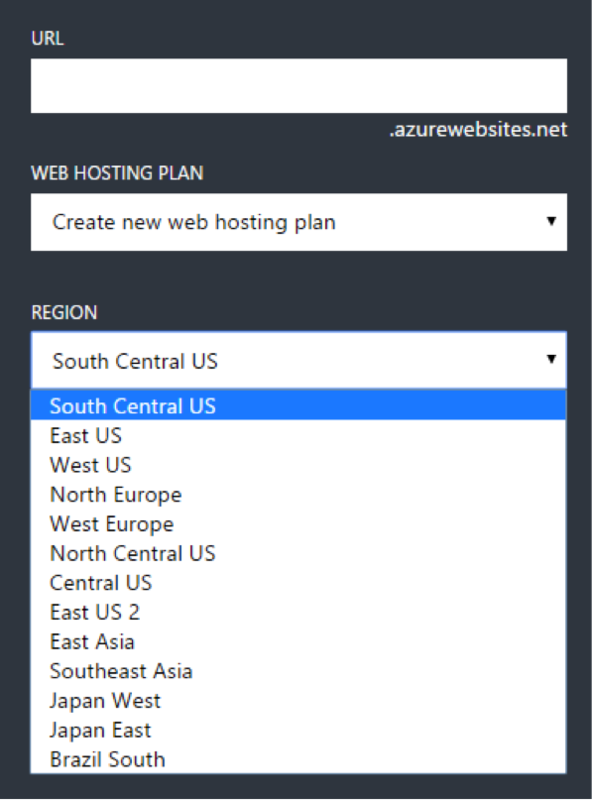 But if you maintain solely Azure for your primary website/database, but in different regions, then a failure in either region could out the entire primary site (they both need to work). But now you have the backup site, which will have real-time concurrent data from the uploader. If the backup site does not share same Service Provider & Locations, then you are creating redundancy against Cloud Provider and geographic location disruptions. And there are many hybrid scenarios such as having two websites, each in a different region, pointing to the same database. In this method, you are assuming the database will not fail, and if a website fails, you would have to reconfigure the “uploader” for the new REST API destination. Finally, as mentioned earlier, there is an “advanced” option which introduces a completely separate Cloud Provider – Heroku. Heroku is more technically focused, is a completely separate process, is not documented with videos or step-by-step instructions, and is not the “community support” standard. It is still free, but just like Azure, you can do things that would become “charges.” Basic Heroku information is supported at this time, but it is truly “do-it-yourself.” The benefit of Heroku is that it is not Windows Azure, so the website is totally independent of Azure. Additionally, Heroku can use your existing Mongo database (possibly hosted by Azure, possibly not), or within Heroku, you can create your own “mongodb” in order to tightly couple the Heroku website (app) and add-on (mongo database). The following steps assume just one additional website and database. But you may have multiple websites and databases if so desired. Choose / Select your existing database that you want to copy. Choose Plan – Ensure you have selected a Cloud Provider / Location combination that will provide you with the “single node” Sandbox option. You will now have a new database, already populated with the “data” from your original site. All the collections, all the data, including the “database username” and “database password” will be copied identically – so you don’t have to remember separate configurations if you do not want to. However, the “mongo connection string” will be different because the PORT and SERVER_NAME will be different. 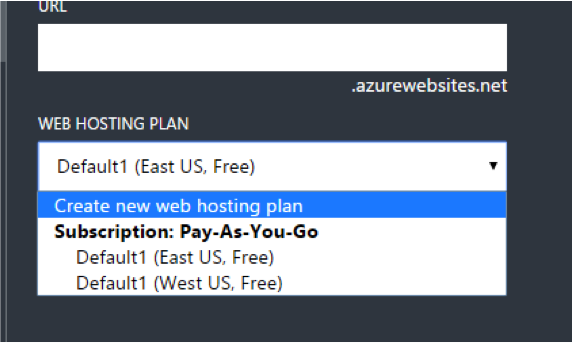 To create your new Azure website, it’s the same high-level processes as your first setup, but there is an important early step which is lost on many during the initial setup – creating a new Web Hosting Plan if you are to use a different geographic region. Note: You will only do this step if you want to create a website in a different geographic location. Deploy “cgm-remote-monitor” from your GitHub fork (repository). Note: There is a single space after “…api/v1” and before “API_SECRET2…” That is the only “space” in the entire line. On your uploader, it may “line wrap” onto the next line as well. And remember, as described in the previous step, the API_SECRET for Site 1 may be the same as Site 2, or it may be different — it is entirely up to you. Save the information and you’re done. Restart your Android Uploader to ensure the new preferences are loaded. Have a 2nd watchface with a different AppID which is available as “Slot 2” from the Pebble Store, or you can deploy from CloudPebble.net. Note: This Lab does not cover have to use CloudPebble. If you know how to do CloudPebble and you know about GUIDs and App IDs, then you’ll be fine. Otherwise, use the Pebble Store or Labs website download for the “slot 2” Nightscout Watchface. For the majority of people, the Azure “free” account daily bandwidth limitation is not a problem. This Lab does not address the subset of users who do have a bandwidth limitation. The implementation of redundancy in your Azure account should not introduce additional fees because the Azure bandwidth measurement is on “data out;” the information sent to your browser. As such, if you are not viewing the “backup site,” it should not be generating traffic against your quota (subject to people you give the URL to, possible search engines, etc.) You should review your Azure monthly traffic analysis to understand your current “usage” with just the primary site, and then monitor for any abnormal growth as a direct result of the redundancy.